This classic Tex Mex fajitas recipe is loaded with strip steak, onions and bell peppers, and served hot with fresh tortillas, guacamole, and sour cream. Preheat the grill. Rub 3 Tbsp. S&F Carne Asada Marinade all over the steaks. Grease the grill with cooking spray. Place the steaks onto the grill and cook until well-marked, about 6 minutes. Continue to cook to desired doneness, 4-5 minutes for medium. Transfer the steak to a plate and let it rest for 5 minutes. Prepare the vegetables: Add the oil to a large skillet over high heat. When hot, add the vegetables and salt. Cook and stir until beginning to brown, about 4 minutes. Add the remaining Carne Asada Marinade and cilantro. Stir well to combine. Transfer the veggies to a bowl. Cut the steak into thin slices against the grain. 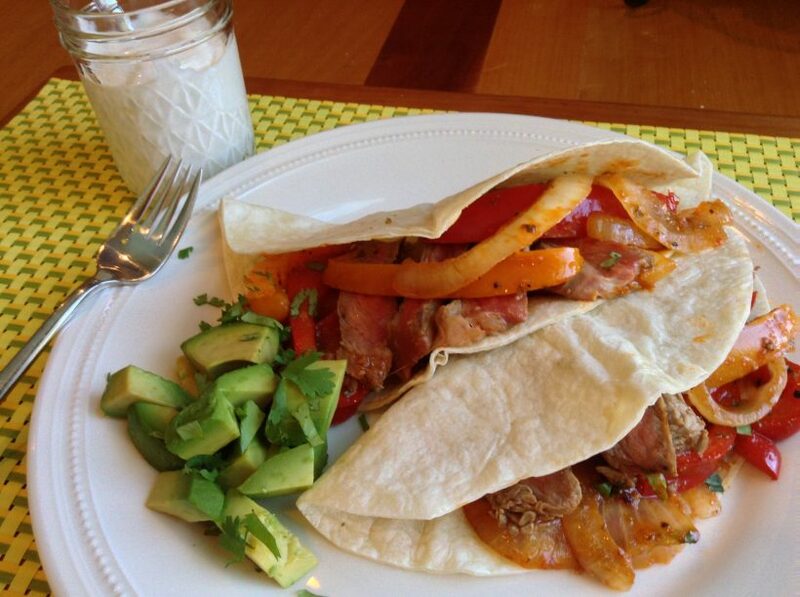 Serve all of the fajita components (steak, vegetables, tortillas, avocado and sour cream) family style.